Ohemgee, for serious, this week's book so far is amazing. 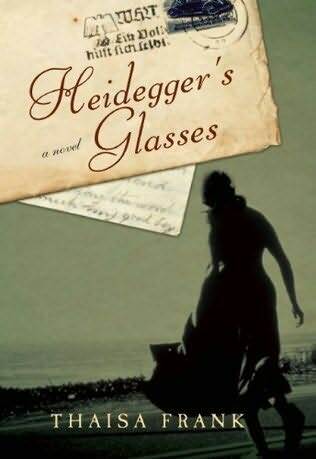 I'm reading Thaisa Frank's Heidegger's Glasses, a historical novel set during the Holocaust. This scene comes right from the opening: Elie Schacten is a Polish Catholic plucked to work for the Nazis because of her perfect Aryan looks. She has just smuggled three Jewish children into Switzerland and is trying to collect some goods to use for bartering in the future. As always, my teaser is a little long. Stay the night, said the officer, patting a confiscated couch. I'll keep my hands off you. I promise. You have more than hands, said Elie. My feet are safe, too, said the officer. He pointed to a hole in his boots, and they laughed. @Steph, I am a little nervous it might be philosophy heavy -- not my strong point -- but so far it's just straight-up deliciousness. I mean, it's already grim, poignantly so, and very thought provoking. I can't wait to settle down this weekend to read it. I also think may be too heavy for me. Thanks for the comments and the recommendation. I am going to look for it. This book is an upcoming TLC tour for me...can't wait to read it! @Staci -- That's how I ended up with it! I'm so glad, too -- it's amazing! Can't wait to see what you think of it! I just received a copy of Heidegger's Glasses also and, after the snippet you posted, am looking forward to it quite a bit! @Sarah -- I know it's going to be a dark book, but the writing so far is close to luminous -- everything is so ... delicate but not light? I don't know how to describe it exactly but it's so engrossing.